Welcome to my very first knitting post! I am super excited to be sharing my love and enthusiasm for this new hobby of mine with you! Before we get started, I want to clarify that I am not and am in no way purporting to be a knitting expert of any kind. I am truly a novice. My reason for starting this new monthly knitting series is very simply that I want to share my newfound passion with others who might just happen to have similar interests. That’s the main reason I share all of what I do here and on YouTube. I plan on breaking up this post into three categories, including projects I’ve finished in the past month, any yarn hauls or projects on the horizon, and a look at my monthly Knit Crate (a knitting subscription box! More on this later…). Let’s get started! I started off the new year jumping right back into knitting after a very long hiatus. My Grandma taught me the basics about ten years ago when I was home on break from college. As much as I loved the craft, I put it to the side when I returned to school and my coursework. Over the years I’ve thought about picking up the needles, but it wasn’t until late last year that real motivation set in. 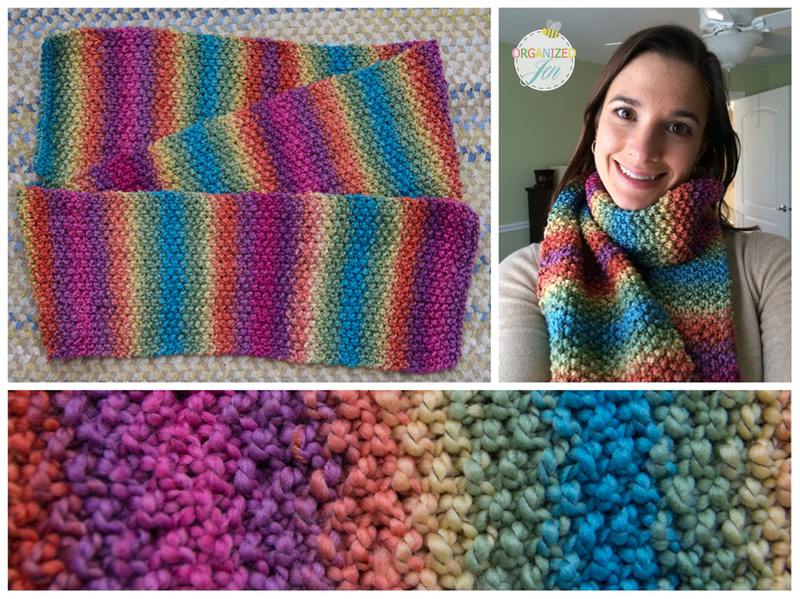 I started off with this colorful scarf and chose the seed stitch to help me remember the basics. I used just about three skeins of Maypole Euro Baby #15. I found I only needed a brief refresher course in casting on as well as the knit and purl stitch, for which I turned to Very Pink Knits on YouTube. I used her videos to learn how to bind off, which I hadn’t actually ever done before. I highly recommend her tutorials! They are clear and easy to follow. My second project was a simple scarf using only the garter stitch. I had purchased this Martha Stewarts Crafts Glitter Eyelash yarn in Kunzite #503 a long time again with my Grandma in mind. She loves anything pink and I thought the sparkles would suit her sparkly personality! Again, I used just three skeins worth and found I was able to knit this one up in a flash with the straightforward design. I gave it to my Grandma for her 93rd birthday last week. She was thrilled to learn that I was back to knitting! My third and last project of the month was the biggest knitting endeavor I’ve taken on yet – a knit lace shawl. 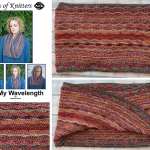 I wanted to start expanding my knitting know-how and there’s nothing like following a pattern and working with a larger scale project to get the ball rolling! I had two skeins of the Patons Divine Chantilly Rose #72406 as well as two skeins of the same yarn in Icicle White I had picked up last fall with a blanket in mind. A new knitting friend of mine shared that this would not be enough yarn for a small lap blanket, and pointed me in the direction of Ravelry, an online fiber arts community and excellent resource, to help me find a suitable pattern. I picked out the Easy/Splendid Triangle Shawl pattern, available for free through Lion Brand. There were many firsts that went along with this project for me, including first time using a pattern, first time working with mohair, first time attempting knit lace, first time working with circular needles, and first time making anything other than a scarf! I used slightly smaller needles than the project called for (8 mm instead of 9 mm), and knit only eight sets of the pattern instead of the suggested ten. I did make a couple of rather large mistakes, including dropping and picking up a few stitches down the middle spine in the center of the shawl, which makes it appear a bit more hole-y in that place than is intended, as well as accidentally adding a row and flipping the pattern to the reverse side about a quart of the way in. This results in a slightly raised portion toward the top center of the shawl, which one could view as intentional. I’m going with it! The result it a lovely “shawlette” as I’m calling it, which is a size much better suited for my petite Grandma. I intend to give this to her as a Valentine’s Day gift. I’m also planning on adding a button so the shawl can be easily kept in place. I am very pleased overall with the result and am feeling much more confident in my knitting endeavors! You can find me as OrganizedJen on Ravelry! I’ve also recently started a knitting group there called Bliss Knits. Please join us if you’d like! I’m trying not to buy yarn without having a project or pattern in mind first, but alas, along with the knitting bug comes the requisite yarn fever that makes it nearly impossible to resist a beautiful yarn when you see it. While I was still in Utah vacationing at the family abode earlier this month, I made a trip to downtown Provo to visit Heindselman’s Yarn, Needlework, & Gifts. I knew I wanted to pick out some yarn to work on a project for my MIL’s upcoming birthday (the exact pattern of which I want to keep secret until after I give her the present in case she sees this). 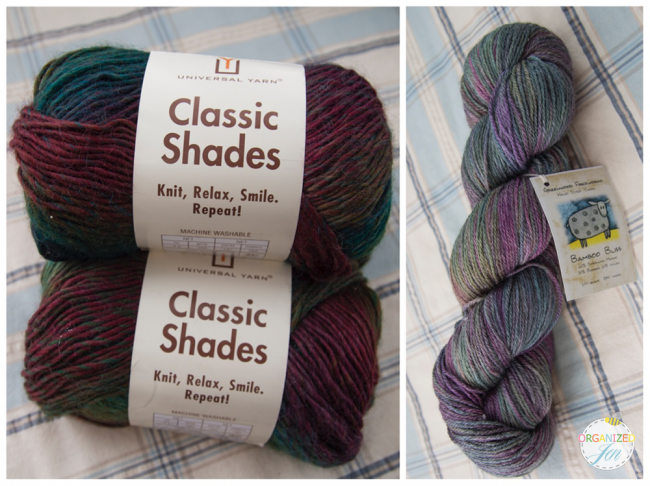 I picked out three skeins of Universal Yarns Classic Shades Roman Candle #716 (above image, left side). I thought the colors seemed fitting for my MIL and I liked the weight and feel of the yarn for the project I have in mind. I was all set to check out when I noticed the local hand dyed selections in the store. I couldn’t resist picking out one to “just have” for the moment. Talk about a total yarn trap! I purchased the Greenwood Fiberworks Bamboo Bliss in Enchanted (pictured on the right in the image above). It is beyond soft! 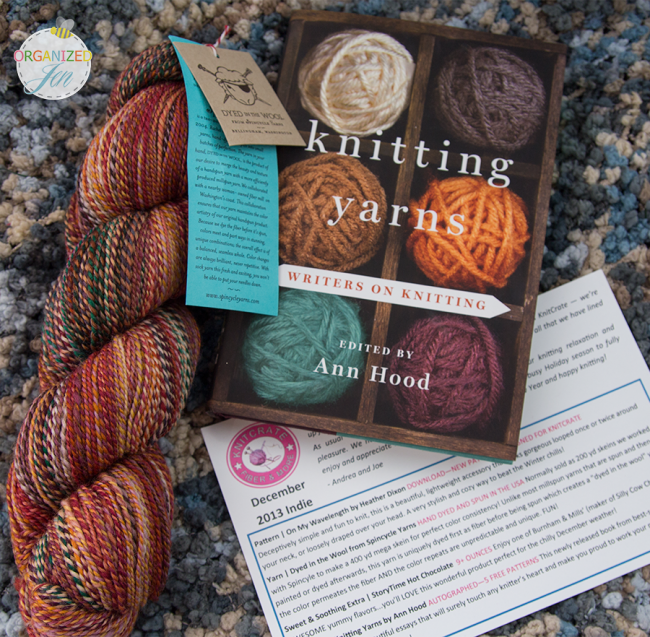 I reached out to the Etsy shop owner who makes and sells this beautiful yarn (in Utah!) to see if I could order more in this color, as they only had one hank in the shop. I still need to find a project to make with this beauty! Any ideas? One of the most exciting products I’ve recently been introduced to is a monthly subscription service for knitters! Andrea from Knit Crate reached out to me late last year as a fan of my videos and asked if she could send me one of her company’s Knit Crate packages as a gift. She very kindly sent me the December 2013 Indie Knit Crate pictured above (minus the hot chocolate, which I left out at the Utah house). I was immediately hooked and decided to sign up for the subscription! There are eight different subscription options, which you can see here if you’re curious. I decided to sign up for the Beginner’s Knit Crate, which includes a pattern suitable to that level, enough yarn to complete that project, a couple of bonus items (ranging from soothing to sweet to fun), and promo codes for knitting related products. I think this is just about as much fun as I could possibly dream of receiving in my mailbox each month! ✻ Cabled Slouch Hat Pattern by Valerie Teppo – Knit Crate claims this pattern is a great starting point to jump into the world of cabling. I can’t wait to give it a try! 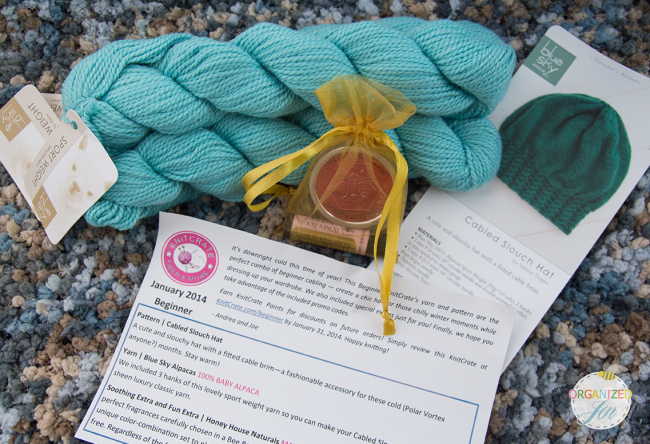 ✻ Blue Sky Alpacas Sport Weight Yarn in Capri #539 – This is the softest yarn I have ever held in my hands! Three hanks worth seems like more than enough to complete the hat. ✻ Honey House Naturals Bee Bar in Honey and Lip Butter Tube in Raspberry Lemonade – These delicious smelling beauty products are the soothing and fun extras this month. Great choices to help combat the winter dry and cold! ✻ It’s Mine Labels Promo Code as well as coupons for a discount on the Darling Mermaids Ebook, free shipping on a purchase of five or more hand blown glass custom buttons from Moving Mud, and one individual free pattern from Toby Roxanne Designs. I’ve also signed up for the 5 Mini Add-Ons package available through Knit Crate. Each month I will receive five 30-yard mini skeins in hand painted/indie dyed yarns. 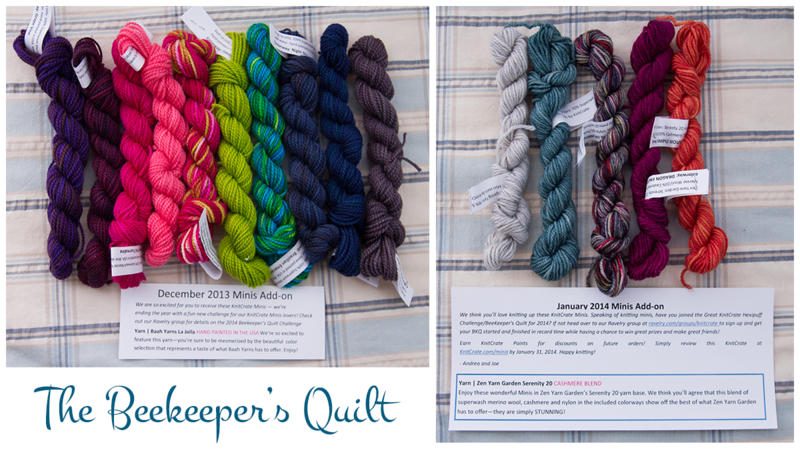 I decided to sign up for this option after Andrea very kindly sent me the December 2013 10 Minis Add-Ons (above left image) and the Beekeeper’s Quilt pattern. One of my larger scale projects is to start working on knitting up little hexipuffs. Once I have enough for my intended quilt size I will stitch then together and voila! A beautiful honeycomb style hand knit quilt! You can easily get started on this project by purchasing the pattern and an included supply of mini skein’s at Knit Crate. Receive 10% off your first Knit Crate purchase (not including monthly or bi monthly subscriptions) by clicking here! I am happy to announce that Andrea and Joe have very generously offered one January 2014 Beginner’s Knit Crate as a prize for one of you! The January 2014 Knit Crate Giveaway will run until Tuesday, February 4, 2014 at 6 PM CT. The giveaway is open internationally. All entrants under the age of 18 must have parental permission to enter. You can enter by following the directions in the Rafflecopter widget posted below. I’ll announce the winner on THIS blog post and contact them directly through email, as always. Good luck! 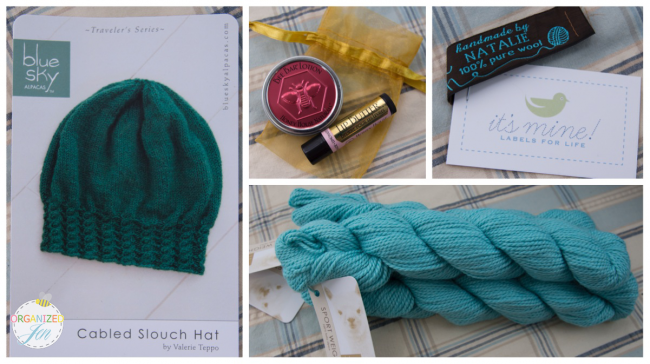 Congrats to Brittany on being selected as the winner of my January 2014 Knit Crate Giveaway! I am so glad you’re doing this…I’m about at the same level as you are and want to keep going. I have always said “skane”… but I will be happy to find out the correct pronunciation as well. That’s how I always thought it was pronounced then people started commenting in one of my vlogs that I wasn’t saying it right. Seems like there is more than one “correct” way to pronounce it. Perhaps it’s a regional thing? Ohhhhhh! I love this!! I used to knit, and this makes me want to dig out those knitting needles again that haven’t been picked up for 5+ years. I’m not a pro either but have made several scarves, hats and one unfinished blanket…..! I love the colorful scarf you made, and I might have to go hunting for that yarn to make one. Skein is pronounced “skane”, yes! 🙂 Looking forward to hearing more, and hoping I win the giveaway. I’d like to play with that yarn for a slouch hat! Keep these coming! Stay warm! I just want to wish you a very happy birthday!!!!!! You make me soooooo happy!!! I really enjoy your YouTube and online content. I was so excited when you mentioned getting back into yarn artistry. I recently crocheted a nice chinky scarf. I really like the multi color scarf that you showed in your video. Will you ever do a video actually knitting? I was never official taught, I just picked up some things along the way but I would love to increase my knowledge and maybe learn knitting too. Thx a million. Love that mutli scarf Jen!!! Skein is pronounced say cane & add an S to it & say Skane! Love all your videos! Happy Birthday!!! WOW impressive! You are good. I have always wanted to learn how to knit or crochet. Beautiful projects Jen! You look very happy and excited talking about knitting. I’ve been trying to learn by self with some DVDs from the public library. I really appreciate if you make some tutorials on your Chanel. Good luck with this new project! Thank you for the opportunity to win a KnitCrate!!! I am waffling about joining but after watching your video I think I will sign up!! Yeah!!! Thank you! I’m a beginner knitter! I really enjoyed this blog and video! I love that colorful scarf you made!! Feeling motivated!! I am so happy to see this blog post!!! I was hoping you’d blog or vlog about YARN!!! How wonderful! Thank you sooo much! I love this new section ! I love knit, crochet and more and i’m so excited that you love it too. This is my first time sending in a comment, and I really do like your you tube videos & your blogs. 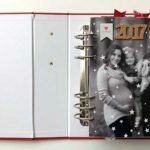 I am a paper crafter and I love it, and a avid organizer. i love your craft room and I loved your holiday gift wrap station/video. But like you I have recently became interested in crocheting & knitting and I am glad you have started the knitting blog, even though I am interested in crochet . I would like to get info on knitting also. I love the scarves you are wearing. Please continue with the information on the different yarns and when you should use them. Also the tools needed for knitting and any information you may obtain for crocheting would be much appreciated also and I see some of the other comments love to crochet too. You were already my favorite and now that you are sharing knitting I am so happy. I am so motivated and excited to try to learn to knit again. I crocheted but have had a hard time learning to knit. Thank you for the inspiration. Enjoyed your video! I do not know how to knit or whatever the term is but I sure loved what you made. I love that seed stitch. I loved the shawl the most and loved the type of thread used on it. Super pretty. Glad to see yet another coming back to the ‘fold’! I blogged about your giveaway!! And joined in of course! I love this knitting video. I am hoping to get back into my crochet and knitting. I am more motivated now. Thanks to you. I hope you have a great weekend. It’s always a pleasure to see your videos. You’re such a sweet and kind soul. I have a question concerning the skein giveaway, and by the way, you are saying the word Skein correctly. I have a dictionary on my phone that pronounces words when one is unsure how to pronounce the word, and both the American and British version of the word is the same. Do not feel intimidated. When in doubt, look it up before going on camera, hear the word, and that way you feel sure and safe. It’s what I do when I’m unsure and I know it will help you as much as it does me. Back to my question. I’m unsure how to enter the giveaway. I wish to make sure to enter correctly, and so this is why I ask. I’m not too computer savvy, and I really wish to enter because I’m disable and wish to lean to both knit and crochet and want to have a chance to win (just in case I do), before buying my starter kit lol. Wishful thinking Ha ! Thank you for your videos. I always look forward to seeing you during my shut in days. It’s good to see kind people these days. Oh boy, sorry, one more question. How many times is one allowed to enter for the giveaway? I’m not exactly sure, but I think the Rafflecopter widget I use will only let you enter once. I may be wrong, though. No restrictions on my part! In WV, we pronounce skein with a long e similar to the way we pronounce scheme. I’ve been talking about learning to knit for about a year….it’s time for a little less talk & a lot more action!! 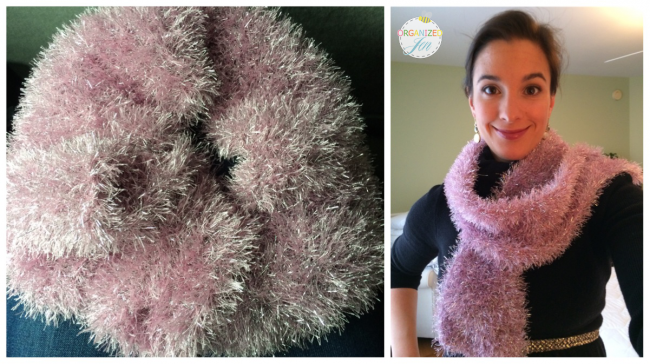 I’m pretty sure my family are all getting scarves for Christmas this year – even the Floridians! i do both knit and crochet but there was no option for that. I’m an advanced beginner and like them equally.. I still have a lot to learn about both. So excited to see the projects you have finished already! My Mom and Aunt taught me how to knit and crochet and I have been at it on and off for years! Thanks for the inspirations to get the needles and crochet hooks back out! Working on an infinity scarf right now for my niece right now from “left overs” it is looking very fun! Will look forward to your monthly updates, and agree on the yarn, once you get into it, it is hard not to justify buying some great new yarns just in case or for projects that are still “ideas” again great to watch the video and read your detailed post! Always appreciate how you come up with new things to inspire and get us to be creative!!! Love the scarf, the colors are beautiful. FYI ..Knit Crate is one word, KnitCrate, thought you would like to know the correct way to spell what you are promoting. Just saw your knitting vlog. Super excited to see what you do next! I hope to have that post up on Thursday! February wasn’t a very productive knitting month for me but I hope March will be! Hi Jen my name is Cindy. I was wondering if you know of any one that is looking for a hand knitter for hire? I don’t but maybe someone else is? I’ve been asked this a bunch and I’m sorry to say that I honestly don’t remember what size needles I used. I didn’t follow a pattern either, just did seed stitch for the whole thing with a knit border. Do you remember what size needles you used for the for the garter stitch fluffy scarf…..were they straight needles? Thanks…love all your blogs, vlogs etc. Do you mean for the fuzzy pink one? They were straight and I believe US 10s. What pattern did you use for the Multi-Color Scarf? Did you do a combo of knit and purl stitches? Thanks for sharing!